Learn more about the book and order it today! #1 Amazon Bestseller in Leadership. Management, Motivation, and Organizational Behavior! For 200,000 years, human beings have moved back and forth between I-Centric and We-Centric societies. Time and again, we’ve seen the “I to WE” pendulum swing. Yet, history has shown us that societies that prospered, withstood adversity, and created real and lasting advancements understood the power of Creating WE. Currently, most organizations today operate in an “I” paradigm. In this arena, we keep score – “I’ll scratch your back if you scratch mine.” We are taught to control our needs and emotions because they are destructive—logic prevails. We are punished for making mistakes and we hide our thoughts for fear of losing our power or status. In a WE paradigm, things are different. 42 Rules for Creating WE offers new insights from thought leaders in neuroscience, organizational development, and brand strategy, introducing groundbreaking practices for bringing the spirit of WE to any organization, team or cause. Each of these concepts contains a set of timeless guidelines, practices and tools for becoming a WE-Centric leader and fostering dramatic improvements in productivity, engagement, and focus. Leaders who have the courage to explore these new concepts will begin to see more productive norms emerge in their organizations. They will see people working together toward common goals, energetically and enthusiastically. And that’s when the real magic happens. 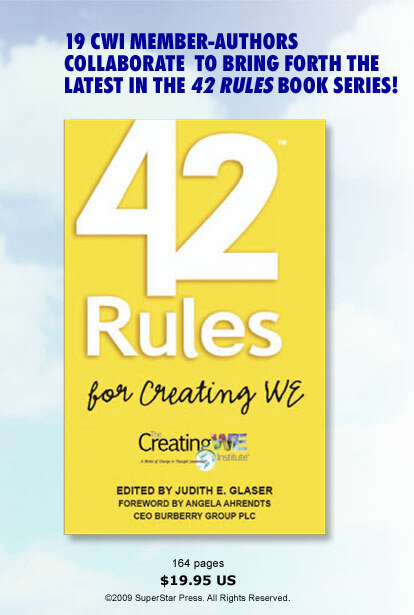 42 Rules for Creating WE is written by The Creating WE Institute, an international group of critical thinkers with multi-disciplinary expertise, who have come together to harvest new forms of engagement and innovation in the workplace. The Creating WE Institute’s mission is bring a spirit of WE to organizations currently operating as a group of I’s. “To create an environment where people can thrive and succeed is every leader’s hope and goal. ’42 Rules for Creating WE,’ with its down to earth tips and tools, masterfully written by those who have spent decades building WE-Centric environments across the globe, is an immeasurably important contribution towards this end. Leaders will forever be thankful for having read it.